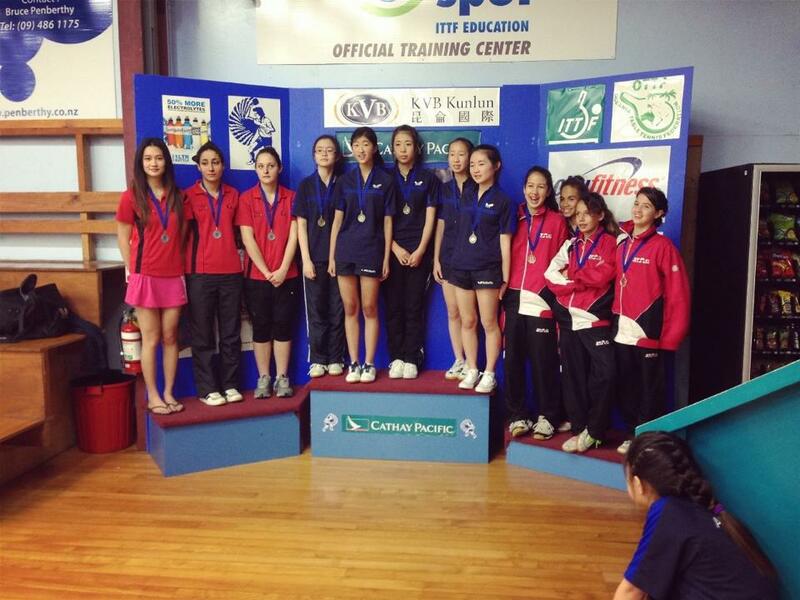 At the halfway point of the third day of competition at the 2013 New Zealand Junior Table Tennis Championships we saw the conclusion of the team events at the ITTF Hotspot Centre in Auckland. The finals battle was the ultimate test for the teams who had worked hard to make the cut. Daniel Lowe captured by Ben Jung serving. In the Under 18 Boys team event it was Roger Rao, Daniel Lowe and Dinyar Irani who stood for Auckland against the overseas competitors from Croydon Districts, Victoria of Dillon Chambers, Yang Shen and Jakob Smith. The Croydon team had had a narrow victory over North Harbour early on, a 4-3 win with each of their 4 points broken down into an 11-9 win in the 5th. Chambers led the charge for the Australian team, trailing 1-0 and 9-6 against Roger Rao the top ranked u18 boy in Oceania he swiftly moved to even the score 1-1, recovering from the deficit. After that point he didn't look back and the first knife blow went to Croydon with Chambers winning 3-1. Auckland struck back with Daniel Lowe's brilliant performance against Yang Shen. 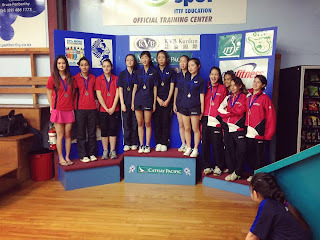 Yang was the 2012 Oceania Cadet champion and was undefeated until Lowe scored a straight sets victory to level the team score 1-1. Dinyar followed with a win over Croydon's 3rd player Jakob Smith and the locals lead the battle 2-1. The doubles was a crucial battle, the Australian pair of Chambers and Yang Shen held an early 2-0 lead before the kiwi pair fought a set back but the Croydon pair outplayed their opposition on attack and took the match 3-1. Tense moments as the team score drew level at 2-2. The pressure fell upon Daniel Lowe as he faced Dillon Chambers, there were some outstanding plays from both players but Chambers held the edge on attack and in the tight game and for the 2nd time it was Chambers who gave Croydon the lead. With the match in the balance Roger Rao stepped up to the plate and brought the Auckland team back with his win over Smith. At 3-3 all the pressure was on Dinyar Irani and Yang Shen to bring the result home for their respective teams. There were moments of hope for the kiwis but by the end of the match it was Croydon celebrating victory as Yang Shen won the match 3-1 and Croydon won the title in a full 7 match duel. Playing off for 3rd and 4th it was North Harbour who earned the 3rd spot. Having narrowly missed out on a finals appearance they were out to secure the best possible finish. Victor Pollet, Liam Young and Leroy Gov won 4-1 over Waitemata's Alfred Dela-Pena, Max Rogers and Kelsey Amor. In the Under 18 Girls Team Final it was Auckland playing Canterbury. Ruofei Rao, Nai Xin Jiang and Grace Huo faced off with Mariam Seif, Ola Ratka and Angel Huang. The Aucklanders wasted no time in their campaign to victory with Grace Huo proving too much for Ola Ratka. Grace forced the errors from Ola and played with consistency and speed to win 3-0. Mariam is the newest edition to the Canterbury team, the Christchurch born Egyptian player returning home last September and back into table tennis after a break. She uses medium pimple rubber with no sponge on her backhand, her ability to use it had caused quite a number of problems for her opposition on her way to the final. For Nai Xin and her short pimple backhand it presented a few less problems. Nai Xin was able to use her short pips to return even the quickest of Mariam's forehand loops and take advantage of the errors in the follow-up shot by reducing the recovery time. Nai Xin won 3-1 to give Auckland a 2-0 lead. Ruofei Rao is the top player in the Under 18 girls team draw and she wasted no time showing it. While Angel Huang showed sparks of brilliance in her offensive game she couldn't match the strong attacking play of Ruofei on both wings. With another 3-1 win for the Aucklanders they needed just one more match to seal a gold medal. The doubles proved to be that match, Ruofei and Nai Xin teaming up to win in straight sets over Mariam and Ola. With a 4-0 win it was gold for the team of Ruofei Rao, Nai Xin Jiang, Grace Huo, Maggie Ngo and Carolyn Zo of Auckland. New Caledonia, lead by Lea Lai Van were victorious over North Harbour to claim the bronze medal position on the podium. Congratulations to all teams competing across the team events and particularly to our medallists today!